Here's the situation: the game is tied, or your team is down 1 or 2 points, with a few seconds left in the game or period. You have the ball out-of-bounds at the half-court line (or just inside half-court). You need to run a quick sideline play that will get you a last second shot, often a "catch and shoot" shot, since there isn't time to make a dribble or a pass. In addition to the plays below, see the sideline plays "Pairs", "Stack" and "Line-1", which can also be used in this situation. See the diagrams below. "Warrior-1" and "Warrior-2" are very similar... it all depends on whether you want your point guard O1 ("Warrior-1"), or your shooting guard O2 ("Warrior-2"), to take the winning shot. In both plays, O4 sets up at the ballside low block, hands on his/her hips, bent over, as though very fatigued. Then suddenly O4 flashes up to the 3-point arc to receive the inbounds pass, and looks for the cutter on the opposite arc-elbow area. 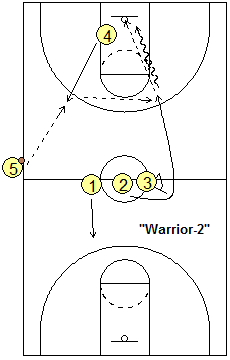 In "Warrior-2", O3 screens for O2 at half-court, and O2 cuts hard around the screen for the pass from O4, and the shot, or lay-up. 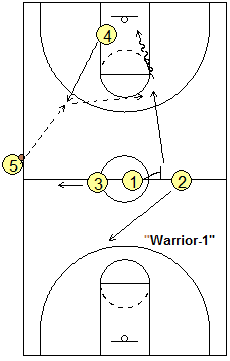 In "Warrior-1", O1 fakes a screen for O2, and suddenly slips the screen and cuts to the hoop for the pass from O4 and the winning shot or lay-up. I especially like this fake-screen and slip, and have seen this play work successfully a number of times with the cutter wide open. Here's a play you can try with several options. See the diagrams below. You can change the player assignments to fit your team's strengths. Have your two three-point shooters (O2 and O3) start down low, with your posts (O4 and O5) spaced out on the three-point arc (or higher) as seen in diagram A.
O2 and O3 will set back-screens for the post players, and O1 may attempt the long pass to either O4 or O5 for the lay-in (diagram B). 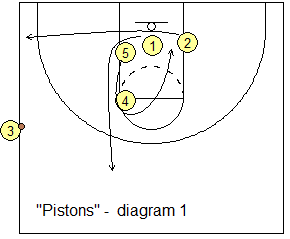 Now, if the defense switches and sags and denies those passes, or if you need a three-pointer, look to diagram C... after setting the screens, O2 and O3 roll out to the three-point arc for the pass and shot. Coach Sar says that in his experience, oftentimes the O5 defender does not like to leave his man and give help defense. In this case, you could switch the roles of O5 and O3, especially if you have a very athletic O3 (one of those slender, long-armed, quick kids that can really jump, catch the ball and finish). This option may also work too if you have a O5 who can step outside and shoot the three-pointer. Now suppose the defense decides not to guard the in-bounder, but instead positions him/her in the paint to prevent the long pass (diagram D). 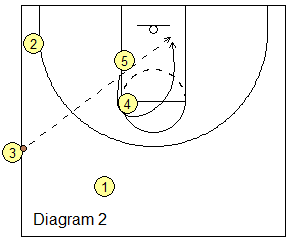 Run the play just the same (diagram E), but hit then in-bounder (O1) with the return pass for the three-point shot (diagram F). One way to set this up, assuming you have a time-out, is to get ready to run the play. Then if you notice that the in-bounder is not being guarded, call time-out and have your team go to this option instead. If the players know both options, or you have no time-outs left, just yell "Option 1" ("1" for the in-bounder, the point guard). This is another "catch and shoot" play with several options. The pass receiver must be ready to catch and immediately shoot if there is no time for a dribble or pass. Diagram A. O3 must read the defender. If O3's defender is playing down in the paint, O4 screens him/her and O3 V-cuts out for the skip pass. 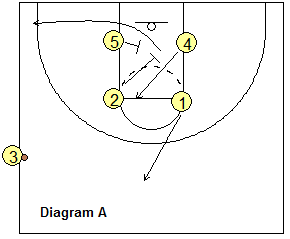 O4 posts up on the block and O3 can either take the shot or O3 and O4 can run a two-man game. Diagram B. Now if the X3 defender is playing out on O3 then the second read is O3 cutting baseline off double staggered screens by O4 and O1, to the ball-side corner. After screening, O4 moves up to the high-post. Diagram C. O4 drops down and sets a screen for O1, while O5 moves to the high post and also screens for O1. O1 cuts around the double staggered screen to the point, looking for the pass and shot. Diagram D. O5 slides to the ball-side elbow and O4 moves to the weak-side low block. The pass from O2 could go to O3, O5 or O1. Diagram E. If O2's defender is sagging way off, O2 could get the return pass and shot. 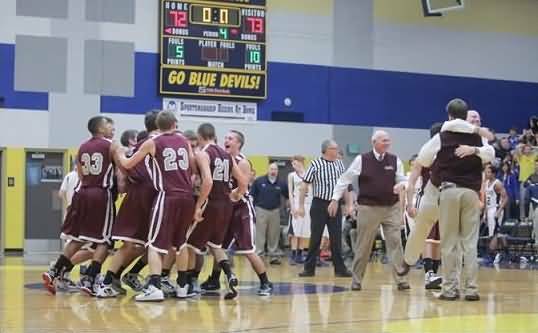 See this buzzer-beater play (video below) from coach Fran Fraschilla's DVD "Baseline to Baseline Special Situations". Start in the box set seen in diagram A. O2 down-screens for O4. O5 screens for O2, and after screening for O4, O2 cuts to the corner. O1 cuts to the top. O4 cuts up to the free-throw line off O2's screen, then suddenly plants the pivot foot and cuts hard back to the hoop looking for a lob pass from O3 (two-handed overheard pass). Notice that after screening for O2, O5 cuts up above the free-throw line, which clears out the paint for O4's back-cut. NBA coach Dwane Casey has used this play for when there is 0.5 seconds left on the clock and you don't have time to catch and shoot. O3 is the inbounder. O4 is a screener at the left elbow. O2 cuts under O1 and O5's screens to the ballside corner. O1 cuts around O5 and O4's screens to the top, calling for the ball. 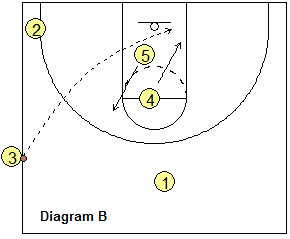 After O1 cuts, O5 curl-cuts around O4 for the lob pass from O3 and the lay-up or dunk. You could also run this when time is not an issue, and then O2 and O1 are options also.